on a trip in a car. 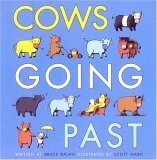 I wrote the first version of COWS GOING PAST over 10 years before I sold it. It received 40 rejections from various editors before Lauri Hornik, who seems to have misplaced some faith in me, bought it. I'm glad she did. It was about time those cows found a home. Cows has received very good reviews and has gone into a second printing.